Departing from central Madrid, enjoy a panoramic city tour that reveals Madrid’s Arab, medieval and Habsburg legacies. Learn about Madrid’s Moorish roots in the ancient buildings of the Barrio de la Moreria, the old Moorish quarter. Then take in the Renaissance and Baroque buildings of the Habsburg era in Calle Mayor, Plaza Mayor and Plaza de la Villa. Photograph the elaborate Baroque fountains, and see the famous Prado Museum from the comfort of your air-conditioned coach. Pass Monumento de la Encarnacion, Puerta de la Opera, Puerta del Sol and other well-known sights and squares, and learn that it was during the reign of Charles III in the 18th century that Madrid became an important cultural and scientific center, attracting artists and intellectuals. View the grand exterior of the Royal Palace, then see the sights of contemporary Madrid’s graceful boulevards Gran Vía and Paseo de la Castellana. Admire graceful squares such as Plazas de Espana, Puerta del Sol and Puerta de Alcala, and pass the lovely Casa de Campo and Retiro parks. The tour also takes you past Madrid’s university and bullring. 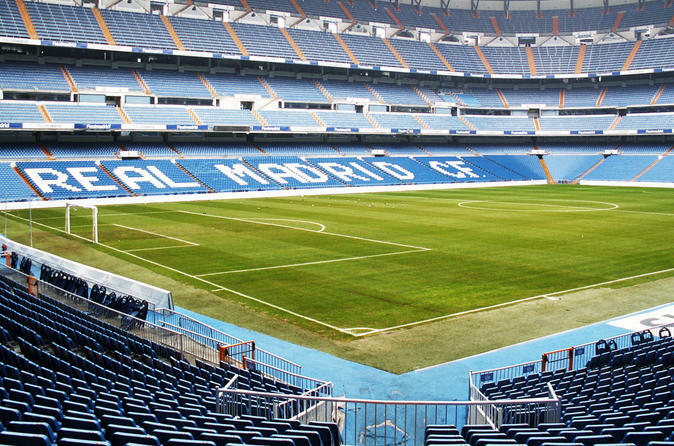 To make your football dreams come true, complete your Madrid tour with a visit to Santiago Bernabeu Stadium, home ground of Real Madrid. Take a unique Bernabeu Stadium tour, with special access to areas normally closed to the public. Follow the tunnel leading to the locker rooms, and see where players sit on the bench. Tour the pitch, pressroom and presidential box, then complete your visit by touring the stadium’s museum, filled with trophies and memorabilia celebrating the Real Madrid team. Your tour ends at Bernabeu Stadium, so take your time and stay as long as you wish at Madrid’s temple to football.